Handblown Snodgrass Glass Top Hat one hitter. Own a small piece of glass blowing history from the Snodgrass Family who, starting with Bob Snodgrass, basically created the glass pipe movement. Silver fumed for classic color changing. Limited Availability. Runs about 2" high x 5/8" width. 1/2" bowl for some nice one-hits. 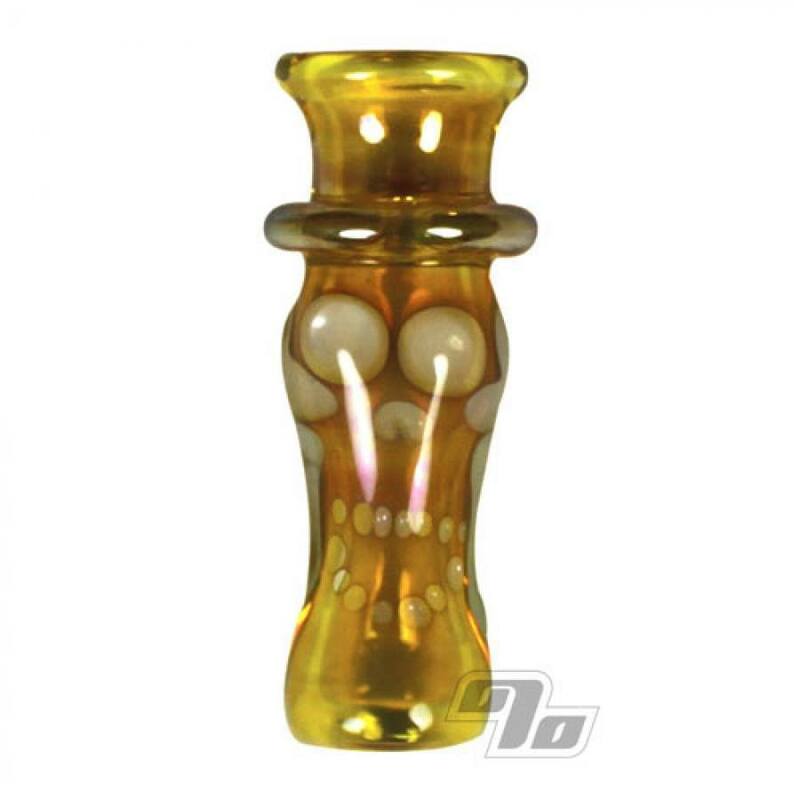 "Degenerate Art | The Art & Culture of Glass Pipes"
This is a sick little chillum/bat! It's smaller than a bic lighter so it's super portable. It feels very comfortable holding it between the fingers and it's just the right length that you don't need to worry about burning yourself. The fuming work is fantastic and the eyes on the skull face are basically small/short marbles that magnify ever so slightly and give the piece a nice rounded feeling. The bowl is definitely larger than "one hitter" size so you can pack a decent amount in there if you really want to. A really well made and functional piece. It is also worth noting that this has a perfectly rounded mouthpiece which is a big plus for me as I have nothing but contempt for flat mouthpieces on any glass pipe. I don't really know who exactly in the Snodgrass family made these particular pieces but they did a great job and it's really cool to have something from the family where it all began! 1percent shipped it and got it to me super fast too! This Skull Top Hat is such a great piece. Don't let the small size fool you because it hits like a tank. The work on it is awesome and looks great colored. The Snodgrass family did a fantastic job blowing these pieces and thanks for 1% for offering a piece of history for a affordable price. Review by Calvin Broadus Jr.
Charming in its minimalistic miniature stature, but it tokes like one of those guys with a rope in his mouth and tied to his man giblets pulling a tommy cruise ship. Sturdy, solid, sleek, slamming, not salmon, ran out of s words hold on, superb, statuesque, surely not a shenanigan to snag this super sweet skull snodgrass. Salutations to the staff > frosted flakes!! Hits like a dumptruck. Thank Bob for your snoody! Great little oner by " the family". Hits like a champ. Thank you for letting be able to own a piece from the legend.